UPDATE (04/15/2019): We’re pleased to announce that all the available tree seedlings have been claimed. Thanks to the campus community for your enthusiastic response! The Hollins Tree Committee is celebrating Earth Day (April 22) and National Arbor Day (April 26) by giving away free tree seedlings this month to members of the campus community. The seedlings are available to any faculty member, staff member, or commuter student who has a place to plant a tree. Nine different tree species are available through April 18, or while supplies last: red maple, silver maple, bald cypress, river birch, persimmon, black walnut, black cherry, silky dogwood (a shrub), and red osier dogwood (also a shrub). The seedlings are approximately one to two feet in length. Members of the campus community can contact Gleim at egleim@hollins.edu to arrange a time for pick-up. There is a limit of two seedlings per individual. 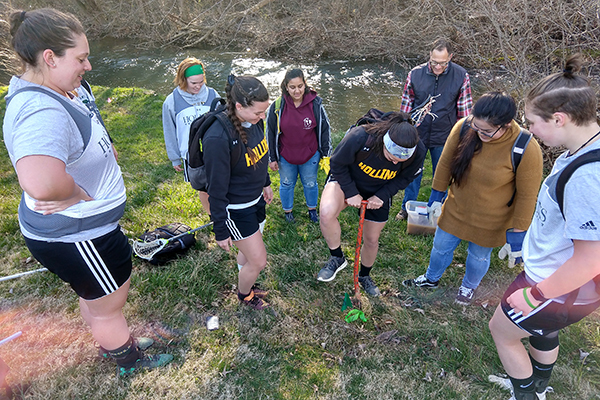 Photo: Approximately 40 students, faculty, staff, and their family members took part in the annual Hollins Tree Planting Day in March. The group planted 90 seedlings along Carvin Creek on the Hollins campus. The work was an effort to mitigate the loss of the nearly 100 ash trees along the creek that are dying due to infestation by the emerald ash borer. The trees planted are all native to Virginia and well-adapted to the soggy soil along the creek, and include river birch, silver maple, and silky dogwood.